Our exclusive Signature Collection Body Lotion is fortified with powerful ingredients like super conditioning Shea Butter, fast absorbing Jojoba Oil and protective Vitamin E to hydrate skin with moisture that lasts all day.Our non-greasy formula absorbs quickly and completely to leave skin feeling incredibly soft, smooth and nourished, making it the perfect daily moisturizer. Key Fragrance Notes: Sparkling Red Pear, Vanilla Orchid and Whipped Chiffon Musk. 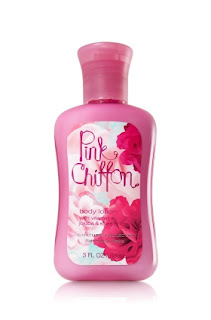 Pink chiffon by bath and body works is a oriental floral fragrance for women and it has very fruity smell I got hand on this product last may even though i don't really prefer fruity smells but I am truly astounded the fruity smell just made me love it. It smells so good and sweet and girly the smell is so incredible it literally smells like pink and it also smells like a cotton candy. In all honesty, this is not the kind of scent I would normally choose to wear but it grows on you once you start enjoying the mysterious and alluring blend of floral, spicy and fruity aromas. In my opinion, the scent symbolizes blend of feminity. Initially I bought a travel pack only but after using it for few days I could not resist but to have its body Creame,hand gel and spray. Now to have my hands on its perfume. Overall, it’s good and it had made its place in my must have list product. In Dubai : In all famous malls u can get it very easily. they have setup outlet for B&BW . u can use Discount Code : BBWFEB13 to avail 20% off on any purchase. This lotion smells heavenly! I get many compliments whenever I use it. It's not too strong either. I will buy it from storemass an online body and bath works shop in Pakistan. I will buy it again.